How Realistic Should Sci-Fi Be? 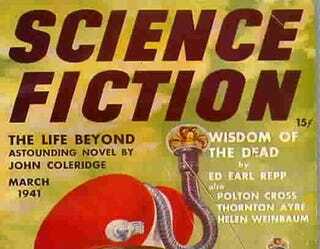 Should science fiction make more of an effort to keep up-to-date with science fact? As part of the UK's National Science and Engineering Week, that's the question that the BBC asked four well-known SF authors. The mundane movement is challenging writers to drop ideas that once promised to be scientific ones, but are now considered as fantasy - faster than light travel, telepathy etc - and to concentrate on the problems of the human race being confined to an Earth it is using up. But this is as much an artistic movement as an ethical one. The existence of such a movement, though, suggests that science fiction feels a sense of mission. Unlike its cousin, fantasy, it wants to be talking about the real world in ways other than metaphorical. A recent, undoubtedly short-lived school of thought, mundane science fiction, wishes to stick to the facts and eschew any flights of fancy such as starships or aliens. How very boring of them, say I. What, no zany thought experiments? Zaniness is an important part of science fiction, as well as operating within a certain framework of rationality. My new book is a mainstream novel that borrows science fiction tropes. It plays with the idea that there are an infinite number of different worlds. So it's using speculative hard science. And it's important to the book that there's a degree of respectability about the idea of the multiverse, or the many-worlds theory. But in my science fiction, I merrily break as many laws as I can get my hands on. Especially faster than light travel - I have my starships going at unfeasibly high speeds. Sometimes I pay no attention whatsoever to what's possible and realistic. It really depends on the novel.